Radish ‘White Transparent’ (Raphanus sativus 'Rave Blanche Transparente'): growing, planting, caring. Heirloom variety of white radishes. 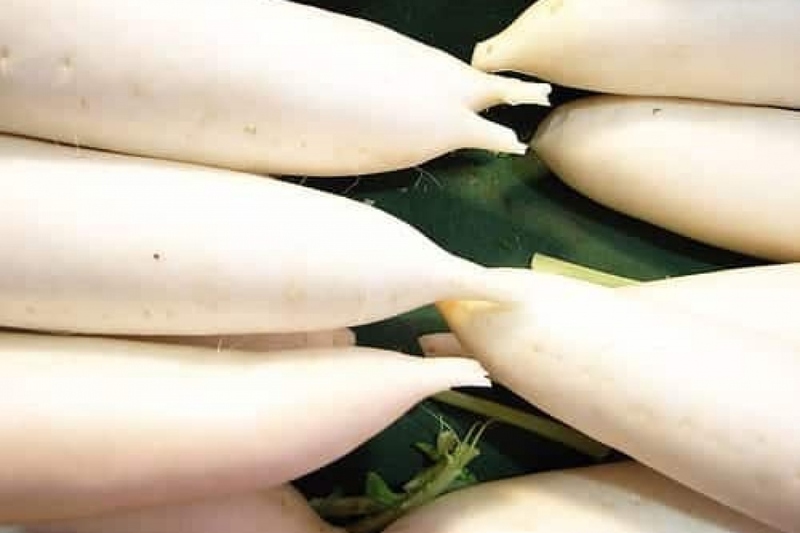 ‘White Transparent’ - ‘White Icicle’ or ‘White Naples’ and ‘White Italian’ - is an heirloom variety of white radish which grows 6 inches long and requires very loose, deeply cultivated soil. 'White Transparent' is an ancient variety of radish also called White Naples or Italian White. It has a long - 20 to 25 cm - milky white almost transparent root with very fine collar. Radishes like sunny areas where they will grow better, but they accept semi shade. They need a light and cool soil - of any type, provided it is sufficiently loosened! Sow this radish from May to September, in a loosened soil, rid of pebbles, by drawing furrows 2 centimeters deep, spaced 10 centimeters apart. Sow your pre-mixed seeds with sand to distribute them more efficiently, and to avoid thinning afterwards! Cover with fine potting soil - about 1 cm - and tamp well. Vary, from sowing to sowing, the sites: because these vegetables suffer to be grown always in the same place. You can mulch with, for example, a very thin layer of dried grass cuttings: this will protect your radishes from being "beaten" by the rain and will limit the need for watering a little! Only mulch after your radishes have grown and never cover the plants: only mulch up to the "collar" — that is where the root ends and the stem starts. Water after mulching. Radishes need a light but frequent watering. - it's the guarantee of a sweet taste! Be sure to keep the soil fresh from sowing to harvest, especially in summer. For once, you can go free: wet the leaves, it will chase flea beetles - also called garden chips - almost the only pest that has time to tackle the radish! After emergence and if necessary, thin the plants, leaving only a small stout every 4 to 5 centimeters, to facilitate their development. Harvests should be regular as soon as the radishes are formed: do not delay because they quickly become hollow and sharp. Remember to stagger your seedlings, so you can harvest all summer! Thus, you can grow your radishes in the open spaces of the garden between other cultures.